I was gone for the weekend but it looks like i didnt miss too much. A eight version of Romhack's Loader was released and BGM/Announcers voice is now working. I cleaned up the first post with all the updated information. Howard, I agree that BG4 is not as fun as BG3. They tried to go more Sim racing rather than arcade racing. In BG3, drifting around the corners was easy and recommend. In BG4, they made the penalties huge for hitting the wall so drifting for the sake of drifting is no longer recommend. They did make a full drifting mode in BG4 but its not as fun. You also have to turn up the Computer Level all the way up if you want competition. The default level 3 is a joke. Well maybe I'm missing something in the settings or something, but the game appears to be racing for me. Since the sound is fixed I thought I would give it another go... the sound DOES make a difference btw, it isn't quite as boring. Anyway I try one of the last courses in the selection menu, this Cliffside course. I think "this will be fun I'll have to keep from driving off the edge, maybe I can knock other people off, ect". WRONG. There are little guides on the side of the cliff, making it impossible to fall off even though the laws of physics would be to differ. I can't pass the cars at all because it's a one lane road all the way down and every time I aim to pick up speed this weird auto-brake icon comes up and it slams on the breaks. And the course was so long and so slow paced (even the speedo on the car never made it higher than 80mph) that I exited out before I finished. Ok so like you said, drifting is awkward on this one, I can't control my speed, I can't wreck other cars and I can't even wreck myself. Why am I playing this again? I feel like I'm missing something in the translation..... literally. Maybe some of the settings written in Japanese at the selection screen would make things better? Do we know anyone with some knowledge of Kanji? I looked at the game data and all the 2d sprites are just png files. If we knew what they said then we could quickly make a translated set. Have you tried multiplayer via LAN on this game? But I have a question regarding missing tracks, are the tracks can be unlocked varying by season or it was time released? Because from what I saw in battlegear.net site, there was a track that took place in Shuto Expressway in Tokyo. There are little guides on the side of the cliff, making it impossible to fall off even though the laws of physics would be to differ. I can't pass the cars at all because it's a one lane road all the way down and every time I aim to pick up speed this weird auto-brake icon comes up and it slams on the breaks. And the course was so long and so slow paced (even the speedo on the car never made it higher than 80mph) that I exited out before I finished. Because driving on the cliff is kinda dangerous and you have to slow down in order to not fall off or it will cause vehicular deaths like you're driving on a dangerous Yungas Highway in Bolivia which is also a one lane road, but thankfully, the road fence will provide the safety of driving but in the game, you just smash the fence which lose a lot of speed prematurely. The game is taking all the fun out of racing! I agree, Taito decided to took most of the arcade racing roots to a Gran Turismo/Forza type game due to popularity of these games which people doesn't play these type of games anymore with the exception of Cruisn' or Fast and Furious games by Raw Thrills. yea, three things. it sounds like your selecting auto braking transmission. If you select the default transmission( the one in the center, its automatic with automatic braking, if you want regular automatic transmission( you control the breaking) then you select the AT on the left of the screen. if you want manual transmission select MT on the right. 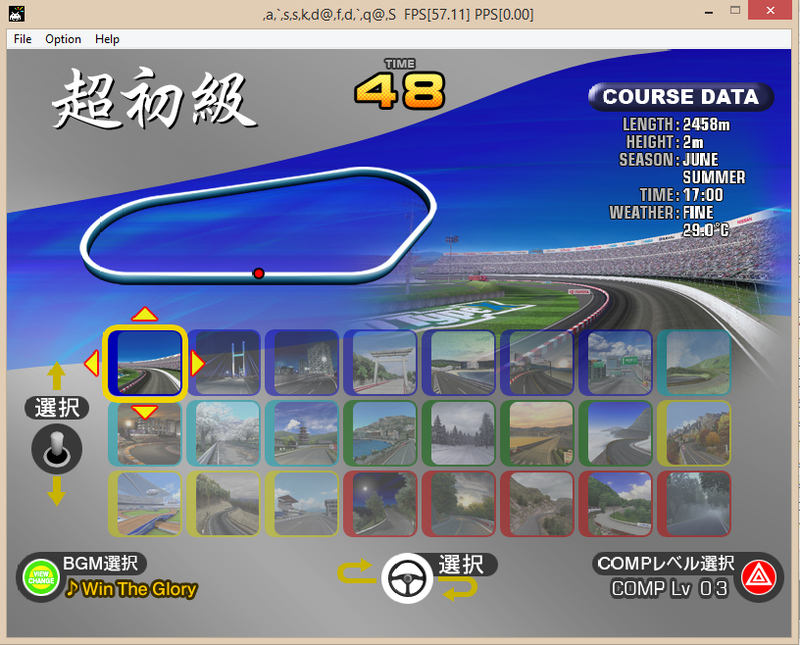 Second is on the track selecting screen, hit your hazzard to increase the lvl of the AI cars 1-10. The mountain roads are hard, there are only a few places you can pass the cars. Thats why its the higher difficulty levels. The third from the last track (green) is pretty fun. Are there any dip settings for this game? I poked around in the data files. 100% of the menus aren't translated, but about 90% are. There's a "USA" folder and "export" folder in a few of the data folders which contain English images for the menus. I could just swap the images of course, but I'm guessing it's a setting I'm missing somewhere. Also there is an English map select folder, which I'm assuming gives us English titles for all the maps. There are a few things that still need translated... namely the "key" menus and the warning menu at the start. i swapped out the common folder. it crashed trying to load it. Yeah you have to swap out the individual images. I got it working, but there's still a ton of Japanese. Editing the pngs would be the easiest route, but again, we need someone that can read kanji to translate the textures without English versions. Maybe there's a site that translates images? Also the game is bugging out on me in the menus. Sometimes I can't navigate them with the wheel... when I'm in the game it works oddly enough. Hmm... I found an image to kanji app and couple that with google translate I can get some really crappy translations. I tried the first image in the game (info about the key) and I can't quite make out the translation. Something about the data saved expiring after 7 days? where did you find the menus? i searched the data folder and couldnt find them? I havnt tried. SEGAOutrun, I bet you have, what was the end result? You finally got network working? That's cool! Play stupid games... win stupid prizes. That's a real shame. I've never played any of the BattleGear games but I always assumed they were similar to Tokyo Xtreme Racer where it's a 1 on 1 highway battle trying to put your opponent into traffic or off the road. THAT would have been cool. this seems more like just another racer that's too realistic to be a fun arcade racer and too limited to be a good sim racer. Hopefully the cracking of this game will pave the way for Chase HQ 2 to appear at some point, which I think will be far more up the alley of the average arcade racing enthusiasts on here. I don't know much about any of them though Chase HQ looks the most "arcadey" of the bunch. I really wish Lindbergh was cracked... Initial D 4 and 5, Outrun 2 Special Tours, R-Tuned, heck even the Sega Hummer game looks fun. When was AC released? I thought that was ios and consoles only? AFAIK it is indeed still ios and consoles only; released back in 2010. I was just referring to the home console versions of AB Climax originally. there are a few people over on AG that have done great work with the Lindbergh but none of them seem interested in releasing their work for legal reasons. I'm not exactly sure why, since Lindbergh is older than the TTX stuff at this point. Sega has completely moved on to the RingEdge and RingWide platform and the Lindbergh hardware is actually reasonably priced now. Lindberg Yellow (which is what most of the good games were released on) is Linux based which is why whatever solutions people have developed are Linux only. I think Lindbergh Blue ran windows but it was only ever used for derby games. Well I think the "Linux only" bit is one of the reasons we'll never see it. People can argue about it all they want, but pc gaming is pretty much a windows only deal. The TTX stuff was cracked by people outside of the traditional emulation community because they are really just windows games...finding people both able to do it and willing to release their work on Linux is a bit harder. 12 hidden tracks have been enabled using a modified config.bin file posted in the comment section of where the loader is located. You may need to reset your pedals when you copy over this file. you can do so by going into the test mode and choosing adjustment. Edit: I like these new tracks a lot, I think some of them actually look a lot more interesting than the original ones. Guys I found a game crashing bug, everytime I'm minding my own business changing the settings for the game, the game just suddenly crashes after exiting the test menu. I'm going to enable the NESYS system to play a LAN game with my friends in the house, do you have the config.bin file with NESYS and Multiplayer link up enabled? i dont think its crashing, it just trying rebooting but it doesnt know what to do. mine closes when i exit test mode as well but it saves my setting. Yeah I think it's saving things improperly or something. Like I mentioned previously, every other time it decides not to recognize the x axis... just in the menus mind you, which is even stranger. It's probably due to the hack. I know real TTX systems save stuff to the D partition and have to be hacked to save in the app path. For a bit unrelated topic, post some of your record time on any track especially Time Attack Mode. Sorry for the bump about this quote, there might been an English version of the game itself which reads out things like "Course 1, Course 2, etc." unlike the Japanese's 「中級 or上級」that this version was dumped. The English folder on this version's file were handful of English but with full of Japanese text, implying that this version came out first while Taito was working out to localize for European and Asian audiences. In some files there might be a US version's copyright screen that was different from Japan and Export versions. Hi there Badmouth, Sorry it took me so long to get back to you on this. The top picture the text is as follows. The voided out area under the "MT" Manual Transmission is 選択できません。 Which means it can not be selected. Operation of the accelerator and break in this mode is normal. This is the accelerator operation automatic mode. The break operation automatically applied. Thanks for the translation, can you translate something on the Car Type screen which there's a banner on the bottom of the screen that told us that you need dirt tires for the race or something? someone just posted chase hq 2 dump. Im downloading now, no idea if the files are encrypted or not. Hopefully Romhack can work his magic on this and create a loader for this one too. Sure PM me a HD screen shot. Someone managed to get the game to boot, but then it suddenly crashes back to the desktop after the black screen occurs. I hope Romhack will work on this beast. 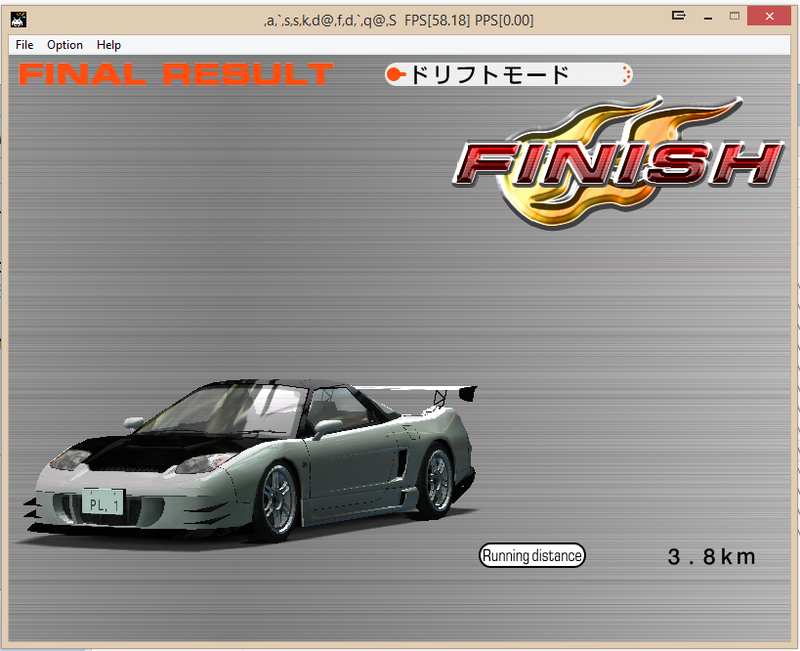 It ran on the same hardware as Half-Life 2 Survivor (Taito Type X2). I was having the same problem on my second PC (works fine on my other one), the game just kept hanging with a 'not responding' message every time I tried to load it up. I'd tried all the dll and other workarounds with no success. Then today, seemingly randomly, the game just suddenly worked. I couldn't understand why it was suddenly working now when I hadn't changed anything. I realised the only thing different was that at this particular time, I had a memory stick plugged into the PC which was assigned to the E drive. I unplugged the flash drive tried to load the game up again and once again it immediately started to hang. I plugged the flash drive back in again and, voilà, the game started working again. Really bizarre, I don't know why this would make a difference as nothing is being written to the flash drive, but having the flash drive plugged in seems to be the factor that dictates whether the game will load or not. That makes a lot of sense actually. Type x games generally have a dedicated partition for save data. Even if the exe/loader was hacked to save elsewhere, there might be a check somewhere that wasn't removed. Eh, I'm done with this one for the time being. I'm just not getting enough fun for the hassle.